Sayeeda Warsi trained lawyer from Dewsbury in northeast England. (CNN) -- Chalk up another "first" for the new British government. Not only does it have the youngest prime minister in almost 200 years and the first peacetime coalition government in nearly 70, it has the first Muslim woman to be a full member of the Cabinet. 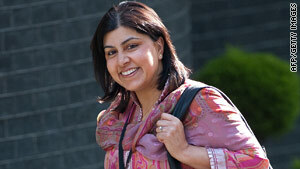 She's Sayeeda Warsi, a Conservative who was named minister without portfolio. It's not immediately clear what her responsibilities will be, a spokesman for the government said. In opposition, she was the Conservatives' point person on "community cohesion and social action." Not yet 40 years old, she's also just been appointed chairman of the Conservative Party. Warsi was also the politician the party put forward to take on far-right politician Nick Griffin, leader of the British National Party, last year. She clashed with Griffin and mainstream politicians on "Question Time," the BBC's flagship political discussion program, in October. She blasted him as a "thoroughly, thoroughly deceptive man" who "demonizes Islam, just as he demonizes Christianity." "Mr. Griffin here preaches extremism in the name of Christianity and brings that faith into disrepute as well," she said. Having stood up to the white far right in London, she came under attack a month later by protesters who threw eggs at her in the town of Luton, north of London. Press reports at the time said the protesters accused her of not being a proper Muslim and of supporting the death of Muslims in Afghanistan. She was hit by two eggs but not hurt, the Daily Telegraph newspaper reported. On her Web site, she names her proudest political achievement as securing the release of a British teacher from jail in Sudan when the woman was accused of insulting religion. Gillian Gibbons had been accused of allowing her students to name a teddy bear "Muhammad." Warsi and Lord Nazir Ahmed flew in to negotiate her release. A trained lawyer from Dewsbury in northeast England, Warsi also lists herself as a campaigner on racial justice, forced marriages and prison conditions. She did not immediately respond to attempts to contact her.